Lots of exciting news these past few days: I got announced as a stretch goal for the UVG Kickstarter, where I will be making a digital DM screen with some expandable functionalities (more on this later as things progress!) With 6 days to go, we are about $5,500 away! Consider this another reason to add to the endless pile of reasons to back the astounding amalgamation of awesomeness that is UVG. Tis a minor setback, though. Fourth, there is a contract in the works for a writing commission! I'm pretty excited because it's in an extremely gonzo setting! More on this soon. Mini post: I made a bot! It's called Twisted Histories! If you're on Twitter, tweet @twisteryhistory to receive a tale of a bizarre historical event! It uses an upgraded version of my Histories of the Blasted Lands that was made in Tracery, a script for generative grammars that allows things like names to be generated in far higher detail and complexity. EDIT: this little bot is honored to be praised by TTRPG's most prolific possum! Gorgeous cover art by Jay LaBelle! EDIT: Beneath the Canals has wrapped up at $6,208 and 602 backers! Thank you to everyone who made this incredible project happen! Chances are if you follow this blog, you've already heard of Beneath the Canals. If not, then this might be worth a read. It started as a humble kickstarter with a goal of $200, and has since grown vast and wild with community interest and support. At the time of writing, it's at $4,971 and counting. It's also, from a data standpoint, a fascinating experiment that has completely defied kicktraq's projections. This looks to be a combination of excellent content creators and intriguing concepts. For instance, we have a living one-page dungeon by Zedeck Siew (hype!! ), a zini of corpses, cadavers, and random encounters made by a real-life possum (who has overcome millions of years of evolution in order to develop opposable thumbs and deliver you quality OSR content), a zini of lost saints, forbidden reliquaries, and ancient religions by Fiona Geist (hyyype!! 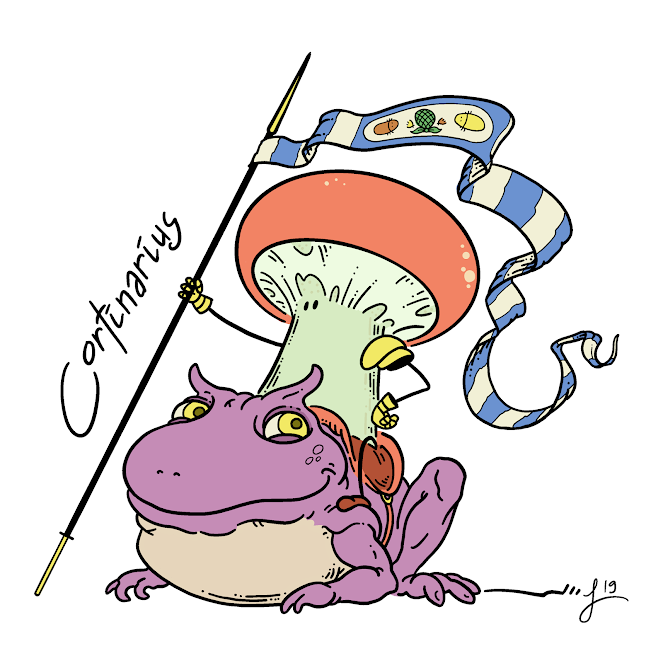 ), and a zini about weird and disgusting fungi by Donn Stroud (of Dead Planet fame). We have a zini by Mabel Harper about a criminal underground of guerilla artists, a zini by Skylar Wall about ancient customs and artifacts, a Swordsfall/Pentola crossover by Brandon Dixon, and a zini about the illicit wares and underground markets by the team that worked on Best Left Buried. We have art by Sinereous, Abigail Lalonde, Michelle Smallwood, Matthew Cartwright, and maps by Foot of the Mountain. Additionally, we've brought on Cassidy Webb, of Form and Void, to do editing! And... just as it so happens... I've been hired to make digital webtools for each and every table and zini. C: So I suppose there is that to look forward to as well. It's got about two and a half days left to go, so now's the time to jump in and get yourself a copy! 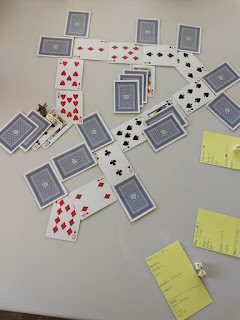 In the last post, we covered basic rules for mapping a city using playing cards. 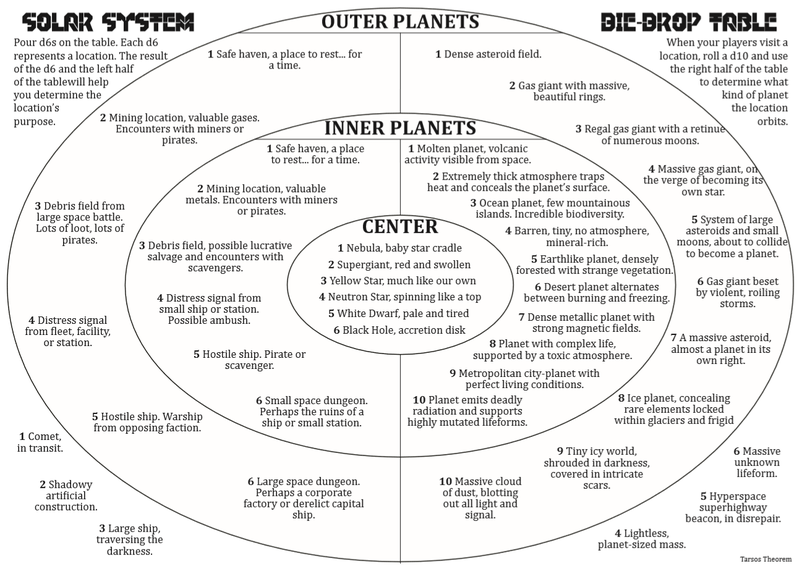 Now let's look at how we can apply this system to constructing ships and stations in sci-fi games. 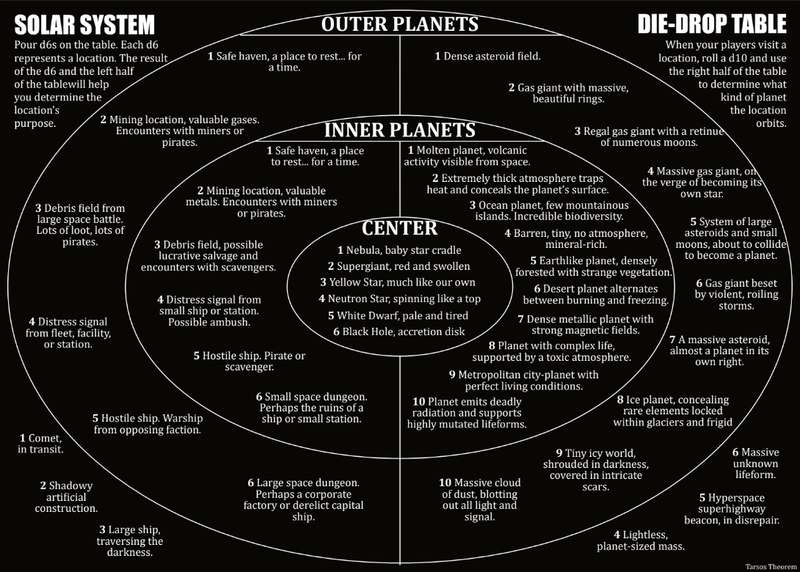 This can apply to stations-as-dungeons that are drifting through the dark reaches of space for players to explore, or it might apply to the ships players themselves commandeer or construct. Lightly armed, with an advanced cockpit and various science modules. Small crew quarters, multiple engines provide maneuverability and initiative. Cockpit: King of Spades (High-Tech bridge with advanced scanning capabilities). Weapons: Two of Clubs (Ion Stun Beam temporarily disables one card of an enemy ship). 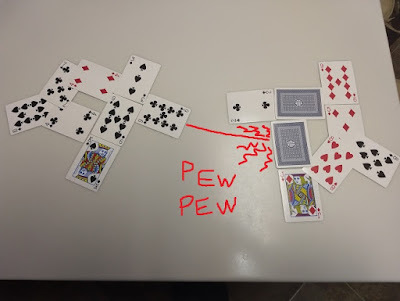 Seven of Clubs (Standard Laser Cannon). Engines: Five of Diamonds, Eight of Diamonds (Two engines combine their capabilities but costs lots of fuel). Science Modules: Ten of Spades (Cloaking Device). 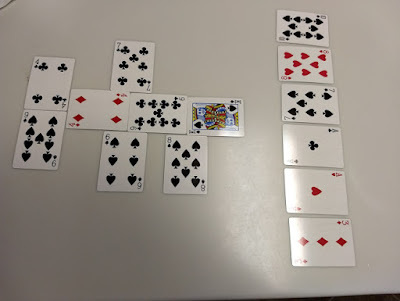 Nine of Spades (Specimen Lab). 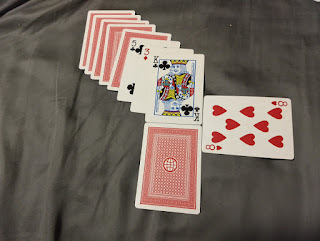 Eight of Spades (Tractor Beam). 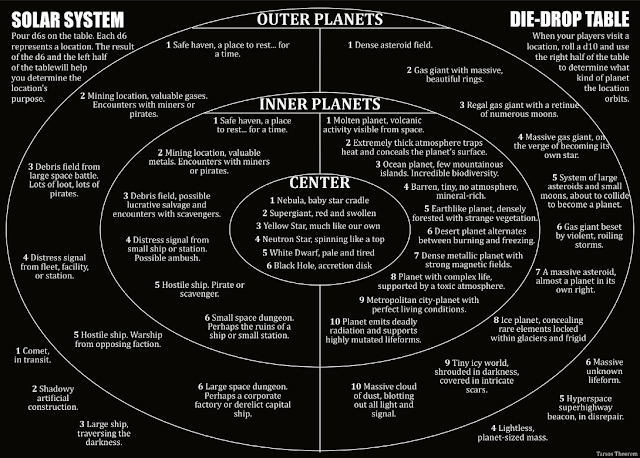 The key to this system is interpretation. 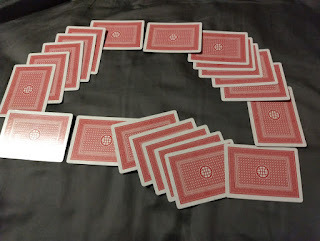 What looks like a pile of cards could become a ship if looked at from a new angle. Your ships will end up a little strange, and that's good: idiosyncrasy leads to interest. Every imperfection is a story. WHAT DO YOUR SUITS SIGNIFY? -Function: Diamonds are engines, Hearts are luxury/storage, Clubs are weapons, Spades are tech/science. (or any other interpretation, point is to have all the major functions covered. WHAT DO YOUR NUMBERS SIGNIFY? -The highest value face-card of a ship is its cockpit. -Effectiveness: For Engines, this might affect initiative and maneuvers. For Weapons, this affects damage. For Tech modules, this gives them more interesting and potent capabilities. For Storage, affects space. -Hull armor: When a weapon attacks this section, the damage is the difference between the weapon's number and the target card's number. If a card takes damage, subtract it from the card's number and then place a new card over it that reflects the new number (to track damage). -Oxygen levels, Light levels, or Radiation levels: (best for space dungeons). HOW DO YOUR CORRIDORS SPLIT? -Can use the same rules from the previous post (multiples of 3 split in a +, multiples of 4 split in a T, multiples of 5 split in a Y). A large, abandoned station drifting through space. Various docking ports still remain. The crew of the Osprey (not shown) decides to dock at the Ace of Spades, and search the station to try and find out why it was abandoned. The atmospheric regulators in Docking Bay XV-07 have been broken for quite a while, so we'll have the numbers represent Oxygen levels, which have been leaking around the edges of the station. 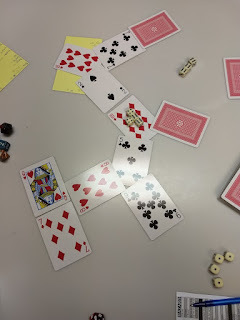 In these images, a pirate vessel (the leftmost ship, bristling with guns and tech modules) ambushes a luxury cruiser (the rightmost ship, much more lightly armed and carrying valuable trade goods).Both ships roll initiative. The pirate vessel wins and goes first. The pirate vessel rams the luxury cruiser. There are two points of contact. 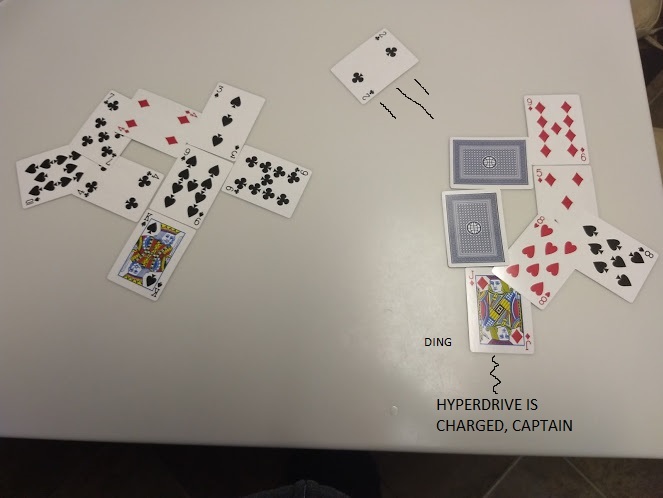 The first is the 9 of Clubs (laser cannon) vs. the 4 of hearts (viewport). The difference between the two cards gets dealt to the weaker one: the viewport takes 5 damage and gets completely shattered. 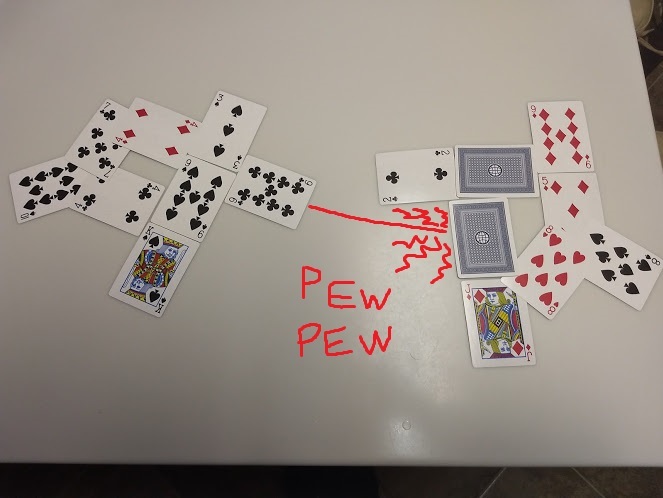 The second point of contact is a highly-armored storage vault (9 of diamonds) vs. a forward scanner (6 of Spades): the forward scanner takes 3 damage and its effectiveness is decreased. The luxury cruiser then gets to act. It moves away from the pirate vessel before any pirates could board, faces the direction of its jump coordinates, and begins charging its lightspeed drive. The two ships roll initiative for the next round. The pirate ship wins again. It fires its forward laser cannon (9 of Clubs) at the luxury cruiser's own forward scanner (4 of Spades), dealing 5 damage and destroying it. The luxury cruiser's small laser turret (2 of clubs) is no longer attached to the rest of the ship! It sails off into the inky darkness of space. The luxury vessel's lightspeed drive is done charging, and it jumps away, badly damaged and leaking oxygen. The pirate vessel could scavenge the debris left behind by the destroyed modules, or it could try to give chase with its high-tech scanning and detection equipment. The crew of the Winter Orphanim Omega, a mercenary vessel, has docked in a shipyard for repairs and upgrades after completing a lucrative bounty. In a line on the right are the upgrades the shipyard has for sale, which were randomly drawn from the deck. They decide to upgrade their forward scanner (6 of Spades) to a long-range system scanner (10 of Spades). They also purchase a luxury storage unit, something they've realized they badly needed after not having the storage space to pick up the valuable debris their bounty target jettisoned into space. They were also looking for an upgrade to their engines (4 of Diamonds), but unfortunately, the shipyard didn't offer any. This post ended up being a lot longer and more extensive than I had originally thought. Thinking about expanding this into a full system, and then putting that system up on drivethru, with a bunch of tables and infographics. Is that something you might be interested in? It's been a long day. I sit down to check the blogroll and see this! Max Cantor has used multiple generators from this blog as threads and, through skilled interpretation and storycrafting, spun them into the history of a world. Max, I cannot thank you enough. 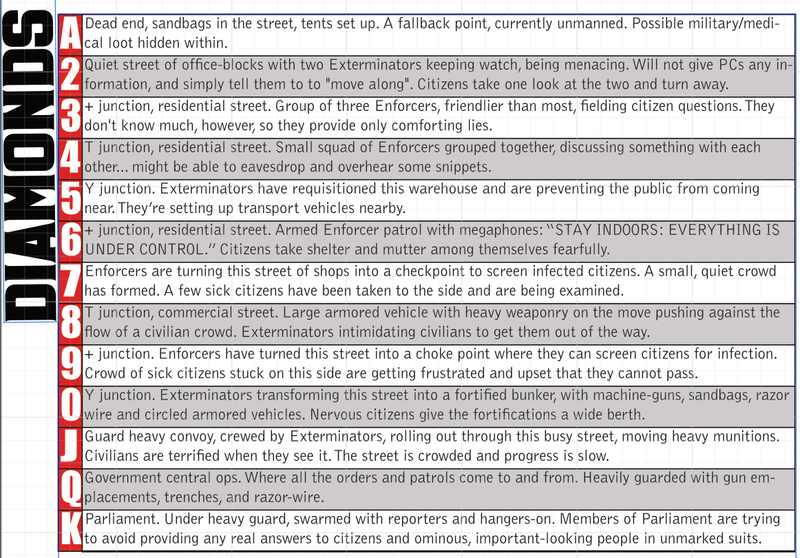 This was exactly what I had hoped someone would do with these generators. This practice you have started, of remixing and celebrating the works of fellow creators, reflects the very best of what our community can be. If you haven't yet heard of this Max fellow, he was the one that inspired me to start this blog in the first place. From the beginning it was apparent that he makes cerebral, inventive content with incredible depth and scope, and his powers have only increased with time. Fettered as they currently are by the stresses of a tech fellowship, still they are fearsome. -Currently working on two large blogposts. 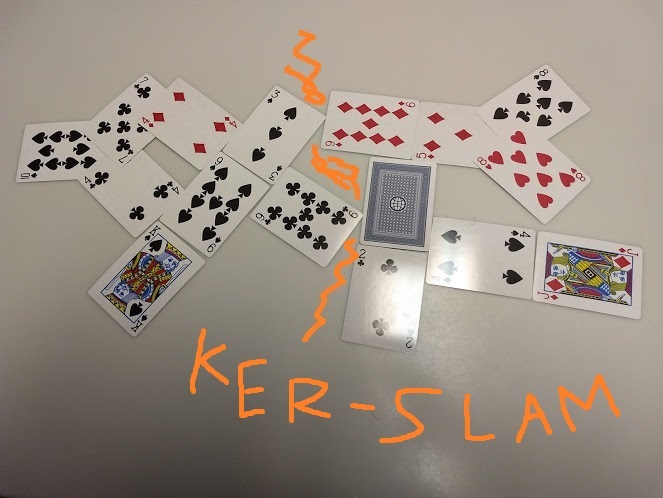 One is a follow-up to Mapping with Playing Cards, the other is a system of a similar nature but different purpose. -An announcement for a fairly large project that I've been working on for the past half-year is incoming. 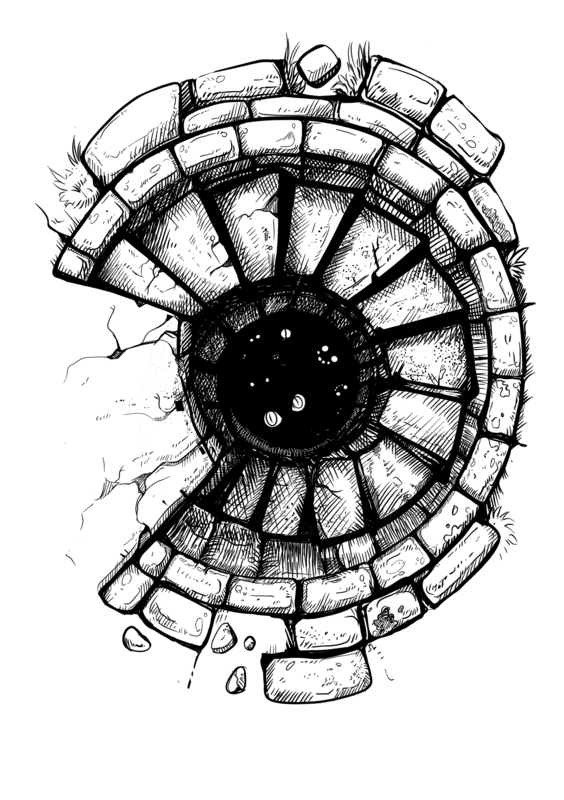 -Additionally, a small but very strange mini-dungeon is in the works. It's... completely and utterly insane. -Multiple commissions are in the process of negotiation. One is for Michael Lombardi's kickstarter project Beneath the Canals, which is looking to be a conflux of stellar art, writing, and visual design by some very talented creators. More on this soon. 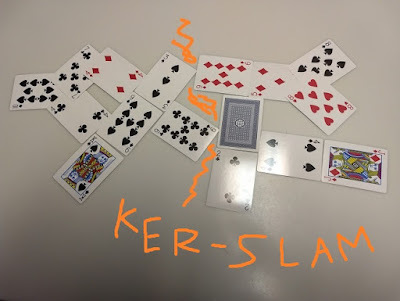 Playing cards can be a random generator and a mapping system at the same time. They contain multiple codified information systems stacked within the same image. You can change the probabilities on the fly by adding or subtracting certain cards from the deck (you can even use this to have player decisions alter future probabilities). One of its biggest strengths is its flexibility. You can codify the layers of information however you want. -Place a card face-up on the table: this is the starting location. Place cards face-down attached to the starting card according to the "how do your streets split?" rules (a few paragraphs down). -Factions. Maybe diamonds are the rich, hearts are the clergy, clubs are the government and spades are the mafia. Or something along those lines. -Biomes: Maybe diamonds are upper-class, hearts are lower-class, clubs are industrial and spades are mercantile. -Level of Activity: i.e. how many people are in the location, or, how many things are happening right now? -Instability/Danger: this could correspond to the lethality of encounters, or the likelihood of dangerous encounters, within that space. You could roll a d12 and if it rolls under the card’s number, it’s a random encounter. Or, if you are using a system with monster/encounter levels, you can use the card’s number as the level. -Wealth: if you want a more nuanced measure of wealth than just equating card suits with upper class and lower class biomes. -Elevation: in a city where elevation is an important factor. -A Faction(suit)'s political or social influence. 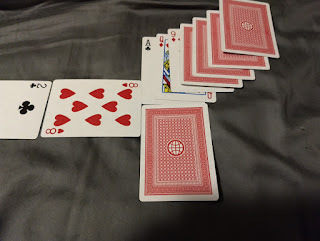 WHAT DO YOUR FACE CARDS REPRESENT? Face cards could represent things your PCs want, or would find interesting. 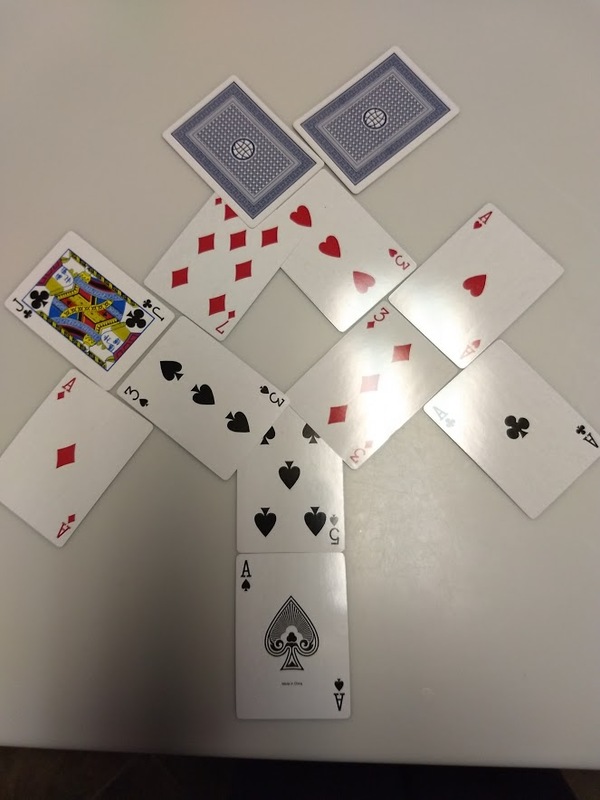 Can use face cards as citycrawling landmarks: if the PCs learn the location of a face card, place it on the table a ways off from where they currently are, then make them citycrawl towards it. HOW DO YOUR STREETS SPLIT? 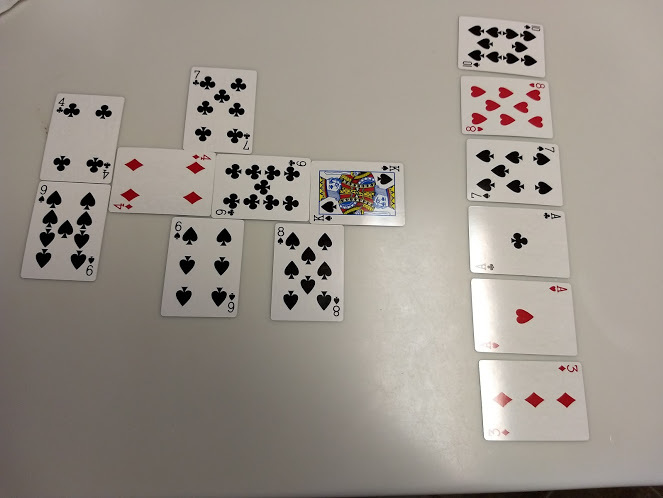 -Multiples: Prime numbers (As, 2s, 7s, face cards) don't split. 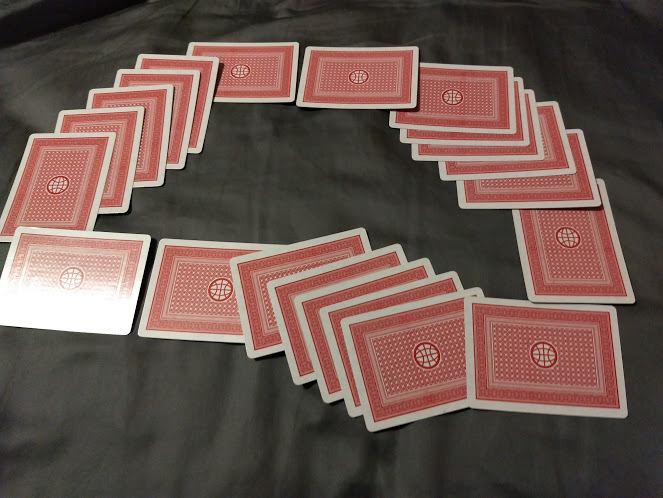 If the Number is a multiple of 3, the street splits in three directions, like a +. If the Number is a multiple of 4, the street splits in two opposite directions, like a T. If the Number is a multiple of 5, the street splits in two directions diagonally, like a Y. Feel free to omit the parts of splits that you don’t like, on a case-to-case basis. -If you want your city to separate into “neighborhoods”, or faction “turfs”, add a rule where whenever you draw a new suit, you have to filter the next d4 draws so they are the same suit. -You can do the same thing with numbers, and filter draws so that new streets are either one number above or below the street it split from, in order to simulate more gradual changes. -We can also add gimmicks to simulate certain peculiarities. 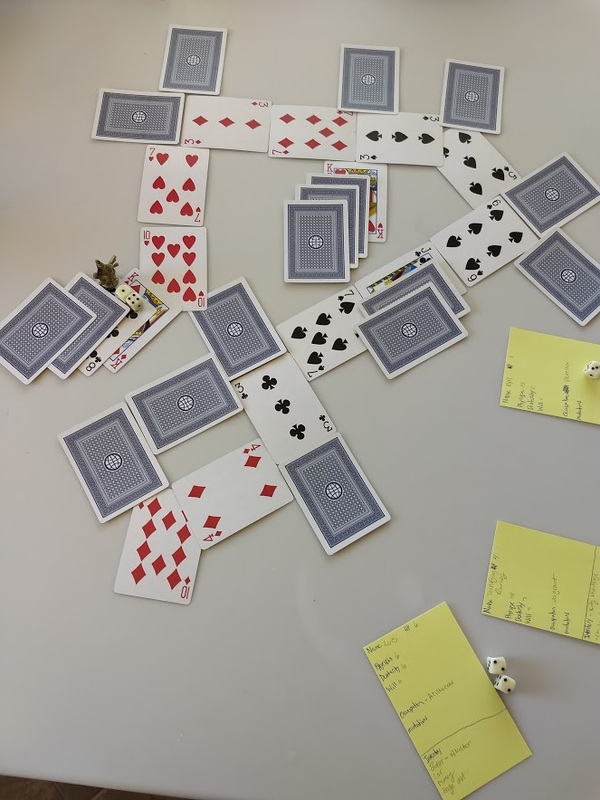 For instance, if we wanted to express a city riddled with secret passageways, we could add a gimmick where players can travel between unconnected cards of the same Number, but roll on a scary secret passageway encounter table or something. -For a short-term visit to the city, you could "save" the city setup by taking a picture on your phone, then reassembling the cards for the next session. -A city consumed by a turf-war between rival gangs. Suits represent factions, and Numbers represent the strength of a faction’s influence. Filter suits to create neighborhoods. 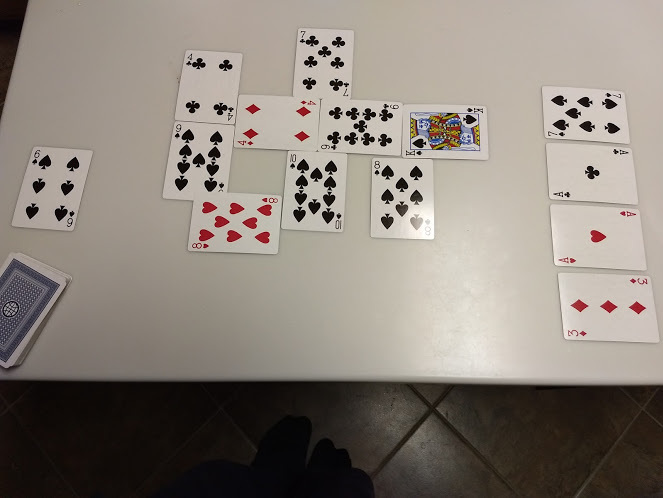 Then the borders between neighborhoods become the amount of political or social pressure a faction is exerting upon its neighbor: a border in which both Numbers are low means very little pressure or conflict, a border where both Numbers are high indicates a full on turf war between factions, and a border where one Number is high and the other low indicates that a faction is about to annex new territory. -Variant on the above: a city during a firestorm. Red suits are areas on fire. Numbers on red suits represent the intensity of the flames, Numbers on black suits represent the flammability of the area (low number equals more flammable). -A city with lots of verticality where elevation matters. Suits represent different factions, and Numbers represent elevation, and wealth is also tied to elevation. The city is very dense, with many intersections so streets split according to a die roll. 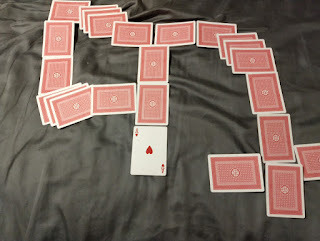 Gimmick: in addition to traversing the streets as normal, players may use gliders or zip-lines to transgress the card boundaries and glide from any street to a nearby street (within, say, 6 inches) that is of a lower elevation. 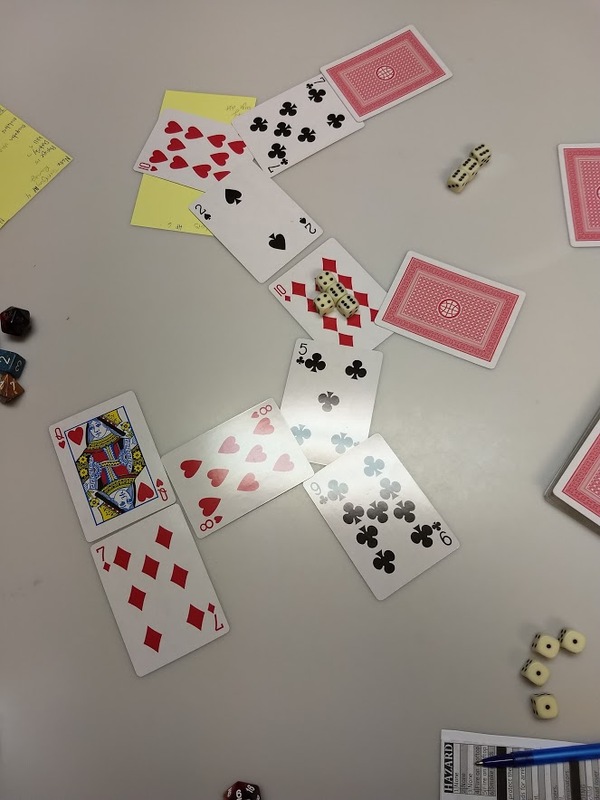 In the above image (a playtest of my upcoming module), Xyn the protester and "Terrifying Randy" the vagrant (both played by Goat Wizard) begin on a wealthy avenue (10 of hearts). 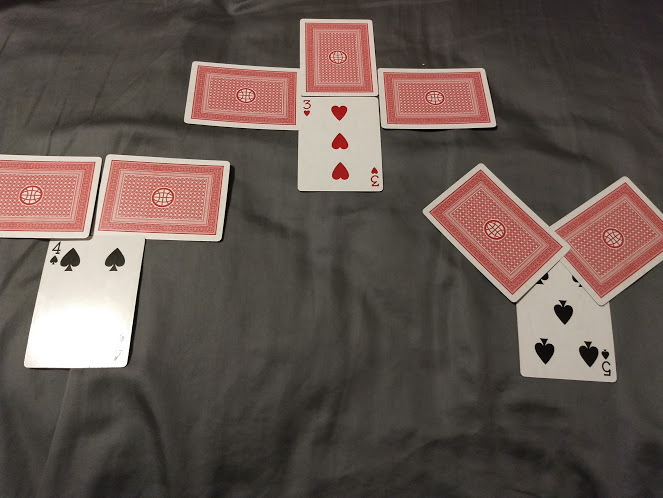 They venture through the city, and eventually rally a group of 18 anarchists (they encountered the anarchists in the 9 of clubs, the entire group is represented by the d6s). 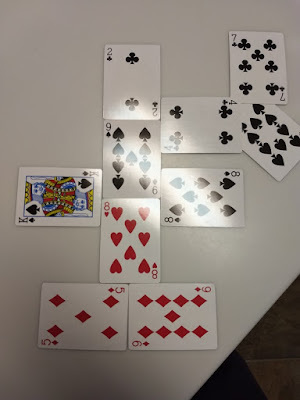 The image shows them trying to protest at a heavily armed and dangerous government barricade (10 of diamonds) before being turned back at gunpoint. 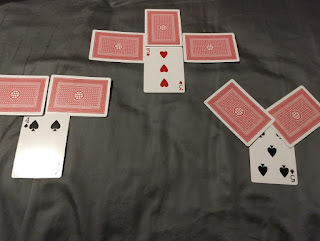 They would later go on to occupy the Cathedral of the Cleansing Flame (queen of hearts) against an oncoming squad of riot police (7 of diamonds) in order to protest the government's mistreatment of sick citizens. 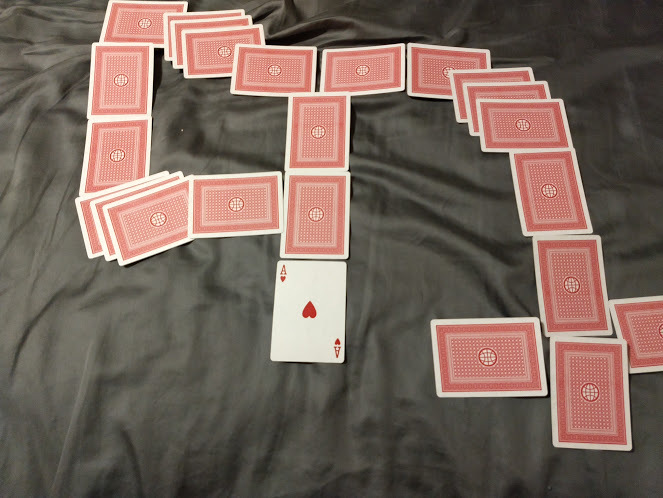 By stacking cards, you can represent a 3-d location on a 2-d tabletop. By stacking them diagonally, you can keep the suit and value visible while also providing a visual representation for the virtual vertical space that the stack occupies. 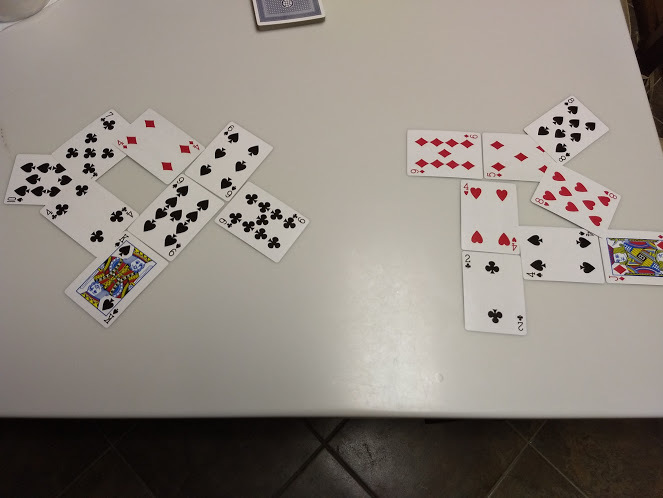 Face cards are areas with verticality. Diamonds and hearts go upwards, clubs and spades go downwards. 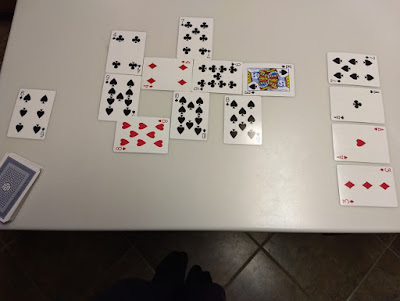 Jacks are 2 levels, Queens are 3 levels, Kings are 4+ levels. Card dungeon and card space station posts are inbound. Updated: permanence section from reddit comment!